UI Health staff Alex Guyan and Melissa Angulo shaved their heads after raising more than $6,000 for childhood cancer research. 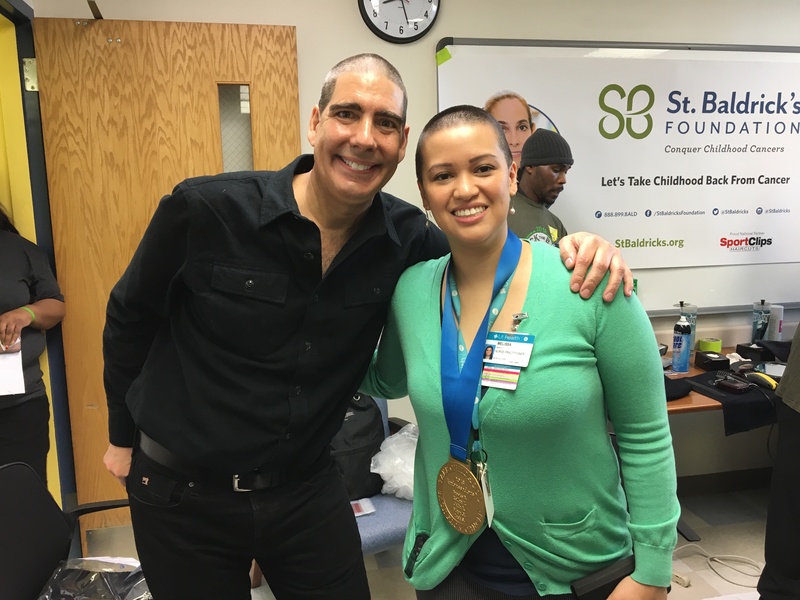 More than 20 people shaved their heads Feb. 16 to raise awareness of childhood cancer during the annual St. Baldrick’s event at the Children’s Hospital University of Illinois. “There is a lot of awareness when it comes to raising money for cancer with adults, and this event is especially great because it focuses on the children,” said Alex Guyan, director of patient care services in the hospital’s Neuro-Surgery Intensive Care Unit. Guyan and Melissa Angulo, nurse practitioner at UI Health Stroke Institute, shaved their heads after raising more than $6,000 for childhood cancer research. “We thought it would be a great way to raise awareness for a great cause,” Angulo said. Benjamin Van Voorhees, head of pediatrics at UI Health, visited with the St. Baldrick’s participants. “It is such a selfless act to do for the kids, and even though not everyone has been affected by cancer personally, they still remember their friends and family who have been affected by it,” Van Voorhees said. Many people came to support the cause, including Michael Isaac, research specialist in the Cancer Center at UI Health. He shaved his head in honor of his friend’s daughter. “This is my first time shaving my head, it feels great,” he said. The Children’s Hospital has raised more than $17,000 this year from the event.